Portrayed is the journey of a soul preparing to enter a physical incarnation. 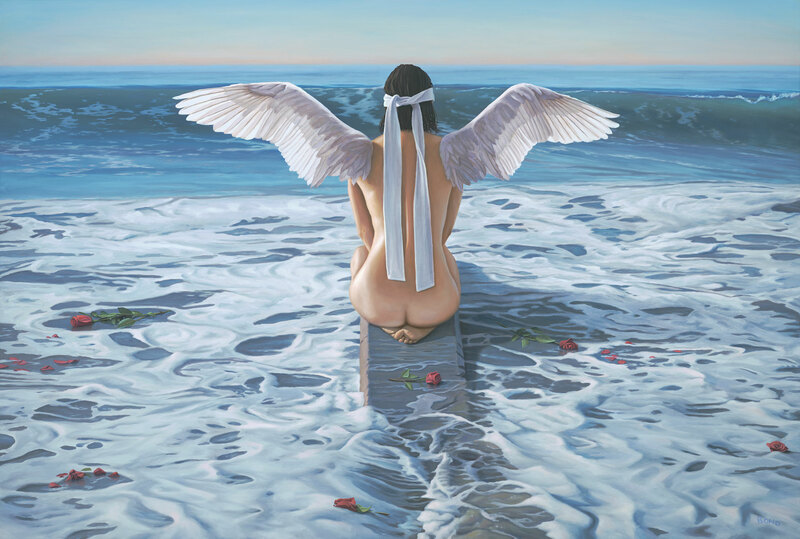 The sea, in which she’s about to become softly enveloped after one last stretch of her wings, is the portal through which she will travel – emerging again in the waters of her chosen mother’s womb. The blindfold represents the forgetting of everything she knew before birth. An apparent loss of the collective wisdom and divinity of the soul. She’ll be blind to her true nature until reclaiming it in the course of this life. The roses scattered in the water are the sweet ‘bon voyage’ wishes from her fellow spirits, bidding her a beautiful life’s journey. A productive sojourn into what, from the soul’s perspective, is but a brief, dream-filled sleep. And a reminder that on the back of each flower petal and blade of grass and with every lover’s touch will be a written invitation to awaken within the dream. To remember who we truly are: eternal, divine, spiritual beings having a beautiful human experience.